The Chancel Choir is the adult choir of the First United Methodist Church, Downers Grove. It provides music each week for the 11:00am service and performs two cantatas each year at Christmas and in the spring. New members are most cordially invited! Provide music for Christ-centered worship that stimulates the hearts and minds of singers and congregation. Provide service opportunities for singers to give of their talents to the church community. Include a variety of choral styles of quality choral literature which accommodate the talents and limitations of the choir membership. Feature anthems and responses that address sermon themes and liturgical seasons. 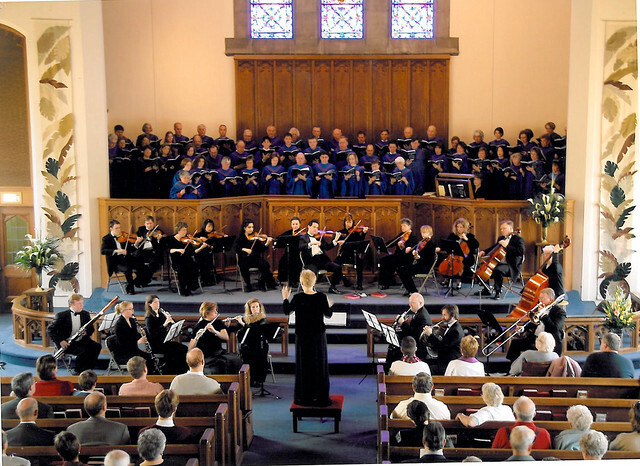 Provide two special services (cantatas and themed programs) annually. Provide a supportive, friendly social community for choir members. Repeats every week every Thursday until Thu May 16 2019 except Thu Nov 22 2018, Thu Dec 27 2018, Thu Jan 03 2019. Also includes Tue Nov 20 2018. The Chancel Choir, along with an assortment of bluegrass instrumentalists, will present The World Beloved: A Bluegrass Mass by Carol Barnett. This music program blends bluegrass and classical in a lively and inspirational way. Please bring friends and family and plan to make this special service a part of your Lenten experience. Our choirs will resume their weekly rehearsals the week of January 6. If you're thinking about joining or bringing your child to choir, now is a great time! They will all be starting new music with the new year. So please join...or...welcome back! All the children's choirs and Chapel Choir resume on Wednesday, January 8. The Chancel Choir will resume on Thursday, January 9. On Sunday, December 15, the Chancel Choir will present a program of most beloved spirituals at the 9:30 and 11am services. Hear soloists, chorus and congregation trace our spiritual journeys. Musical themes include Sanctuary, Freedom and Deliverance, Witness and The Coming of the Birth of Christ. Please plan to make this special service a part of your Advent experience, and bring other music lovers! Chancel Choir Cantata - John Rutter's "Psalmfest"
The Chancel Choir will be presenting Psalmfest by John Rutter with a special guest orchestra ensemble on Sunday, April 21 at the 9:30 and 11:00 worship services. This cantata contains psalm settings written by Rutter over a twenty year period, with the addition of two settings written especially for this work. They contain some of Rutter's most attractive music, with a mix of rhythmic vitality and melodic beauty, finishing with a sparkling rendition of Psalm 148. This presentation provides an ideal time to invite family and friends to visit our church and enjoy the beautiful sounds of choir and orchestra. Read more about Chancel Choir Cantata - John Rutter's "Psalmfest"
Advent - our time of waiting and preparing for the birth of Christ - is celebrated by our lighting candles of the Advent wreath during the first four Sundays in December. This year, we look forward to a special service at the 9:30 and 11:00 a.m. Family Services on December 2, "Do You See What I See?" prepared by the Children and Family Ministries and the Chancel Choir. Carols, stories, and gifts for the children will light our way to the true meanings of our journey to the manger. Everyone is encouraged to bring gifts of food, which the children will proudly deliver to the stable for a People's Resource Center offering. With music and meditations for all, the whole church family is invited to share in this service as we welcome the Advent season.